The protest was the most violent in the past five years, they said. Tensions have risen since moves began in June to evict squatters in the area. Friedrichshain has undergone rapid gentrification in recent years. About 1,800 police were deployed at the protest, which began peacefully but escalated into violence. Eighty-six people were arrested, police said. Can cool Berlin survive gentrification? 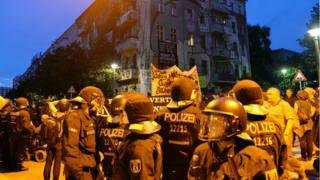 Squatters are refusing to leave part of a block of flats at 94 Rigaer Strasse. Since June, squads of police have been monitoring the building day and night, with helicopters circling overhead. Police fired tear gas as shop windows were shattered and police cars damaged. Many of the neighbours live in housing collectives and sympathise with the squatters, who see themselves as a left-wing alternative to gentrification and rising rents. Living the good life in Berlin's allotments - but for how long?